imagining Fairies in the Castles of Queen Anne's Lace. and discovering Caterpillars on the "milky" weeds. This is what filled my days as a child. When I was a young girl I delighted in playing in the fields surrounding my home. 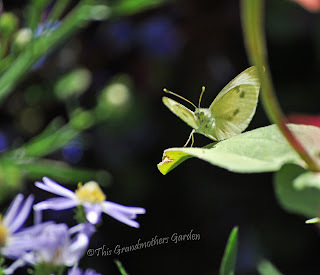 I loved all of nature: the flowers, the bugs and especially the butterflies. Milkweeds were abundant and it was easy to spy the yellow and black striped colors of the caterpillars crawling on them. We captured wiggly caterpillars and placed them carefully in glass jars with a stick or two to climb on and a long fat leaf from the "milky" weed to chew on. With the fat little caterpillars in the jar, we watched patiently for the transformation to take place... when the wiggly caterpillar would become a beautiful chrysalis and then magically become a butterfly. Of course this whole magical event always seemed to occur at Summer's end, about the time school would begin. No matter, we packed our caterpillar jars off to school to share for Show and Tell. Teacher always made a fuss over our treasures in a jar and invited us to place them on the Science table. This was always a big deal because that meant we could learn more about caterpillars and butterflies... and I could never learn enough. My favorite was always the Monarch. 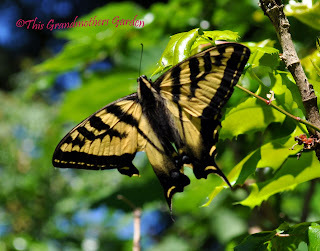 The whole idea of a yellow and black striped caterpillar transforming into a green chrysalis and then becoming an orange and black butterfly fascinated me, and still does to this very day. Fast forward to now. 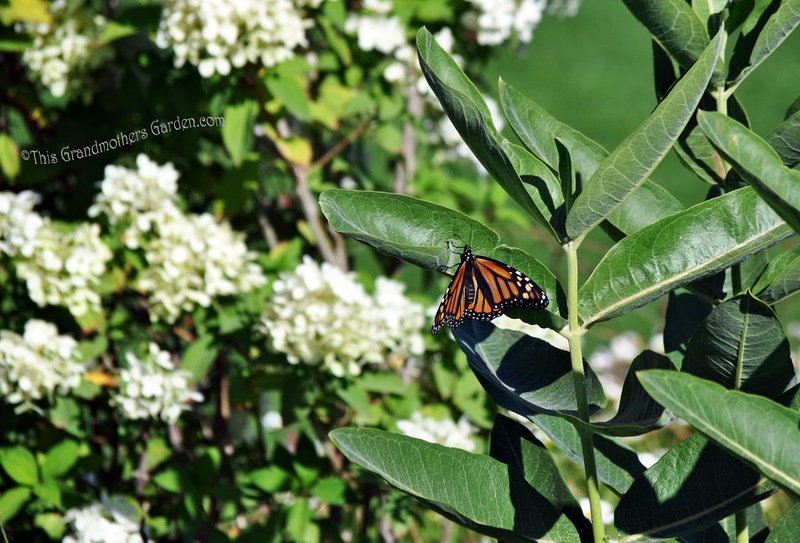 I've lived in this home for eight years and I had never seen a Monarch in my garden. In fact, rarely do we see butterflies of any kind in our gardens. 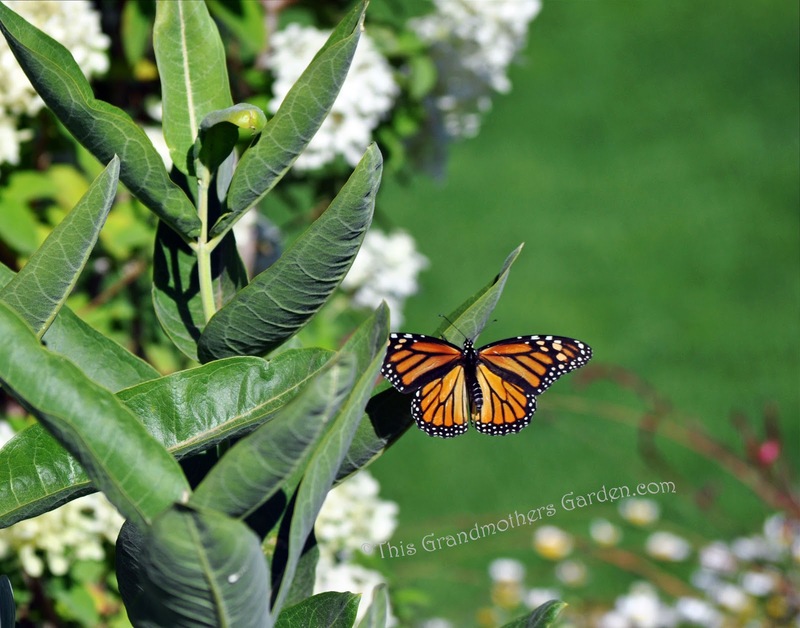 but never have I seen a Monarch Butterfly in my gardens. And oh how my heart has yearned to see one. 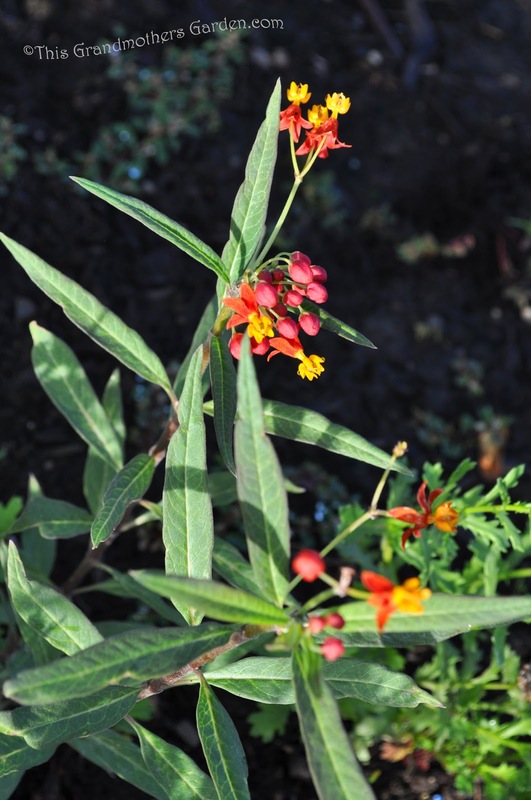 Last Fall, my Honey and I walked the trails of our part of the kingdom looking for milkweeds. We were delighted to find several places where common milkweed grew freely within several miles. Carefully examining each leaf of each plant we encountered, there were never signs of caterpillars. You can imagine my disappointment. Not one to give up hope, I spent the Winter devising a plan to bring these beautiful creatures to my gardens. And this Spring I began to work the plan. I determined that what my gardens needed was milkweed. 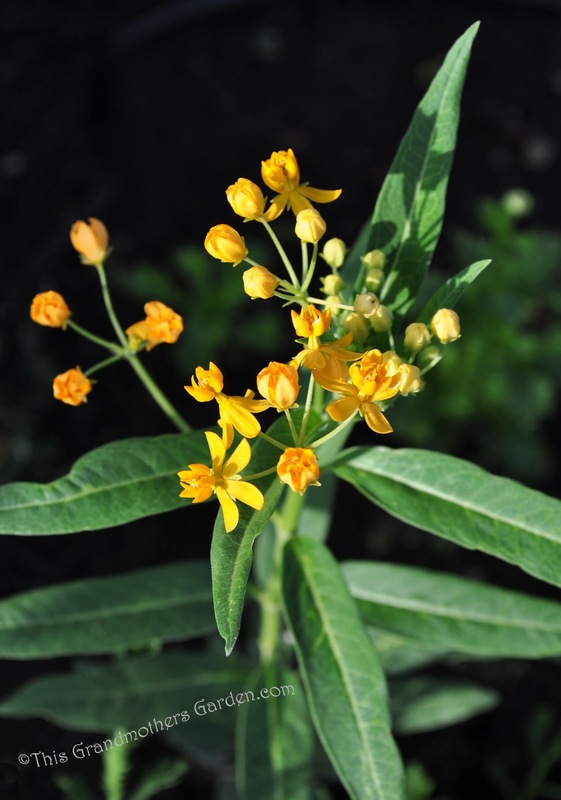 So early last March I visited a website that offered Butterflyweed plants for sale. After determining that they would grow in my garden, I purchased ten plants. I felt like a giddy school girl waiting for them to arrive. A muddy wet spring for the grower delayed my plants for weeks, but they finally arrived in mid June. The little two inch plants I found in the box did not raise my hopes for drawing butterflies to my gardens any time soon nor did our very wet Spring that brought the attack of the giant snails. 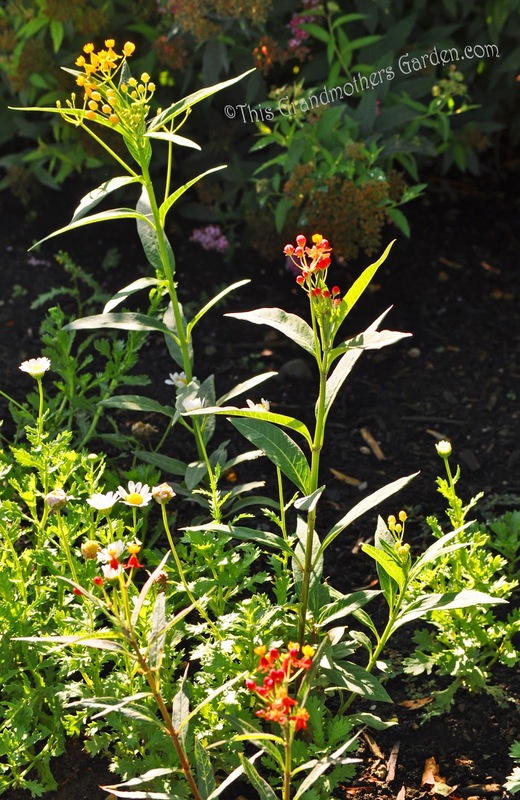 Three plants survived and are now about twelve inches tall with sweet little blossoms in yellow, orange and red. They are growing little by little but I faced the realization weeks ago that this season they won't be much of a butterfly magnet. But that's ok because Mother Nature is working her own plan. just a few feet from where I was nurturing my Butterfly Weed. There is no milkweed anywhere in site of my gardens that could have spread seeds. I've been nurturing it right along with the Butterflyweed. and it's growing like a WEED! a Monarch Butterfly floated through the scene. She simply floated into the picture as I was snapping pics. and then she disappeared as quickly as she came. I am as surprised as I tell the story as I was when it happened. that does not occur randomly nor is it a coincidence." "The simpleness and sweetness will lift your heavy heart." Lovely butterflies, Carolyn. 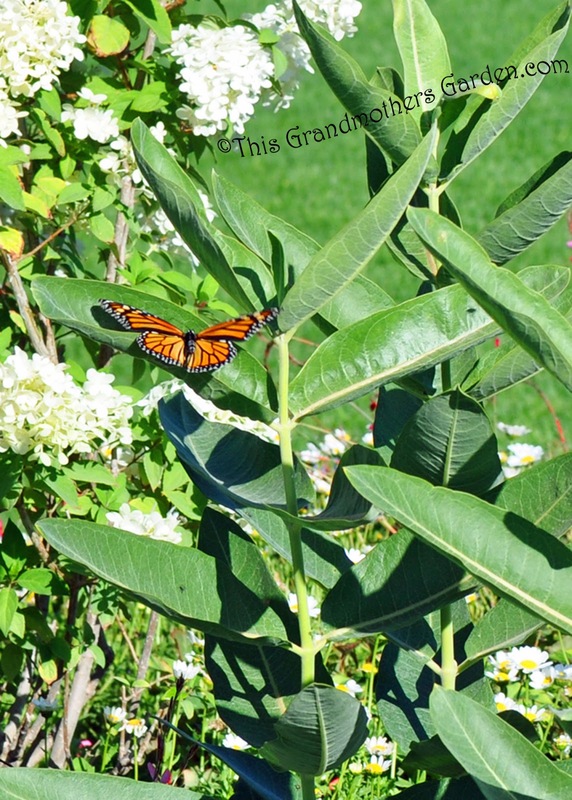 Monarchs are few in my garden also. I rejoice when one visits. The Cabbage whites are here by the scores, front and back. They are not as interesting as the big colorful varieties, but always welcome. My large butterflies always come like your Monarch did. They float in while I am shooting something else. Serendipity. What a beautiful moment. 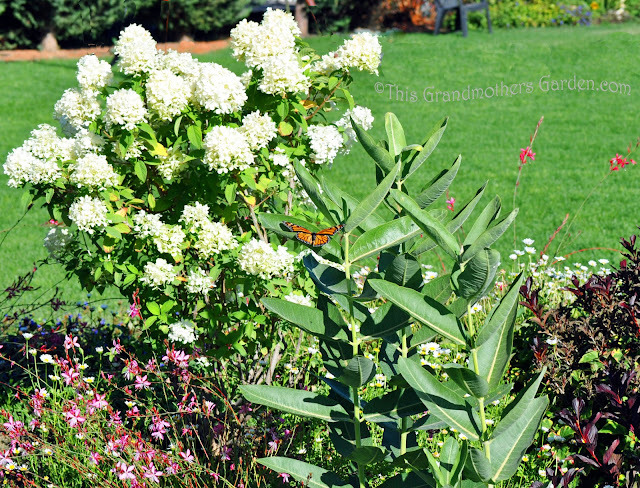 I love monarchs and here Milkweed is just that a weed that I tolerate because the monarchs will lay their eggs on the underneath of the milkweed leaf. Soon you will see the caterpillars munching on the leaves. 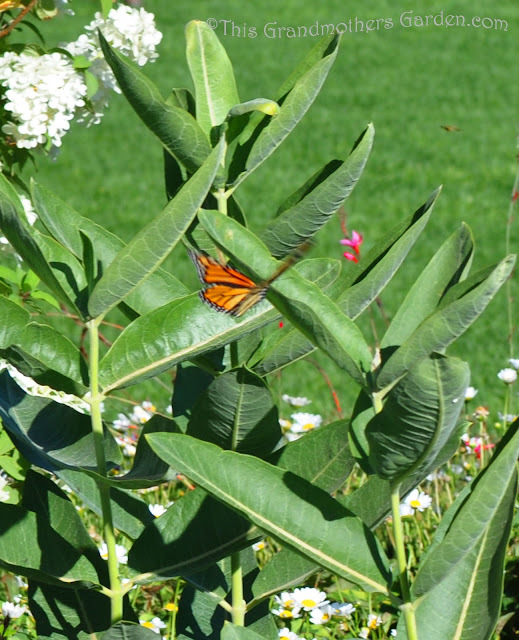 Here, however, I don't think the monarchs have discovered my milkweed. Can't wait for the rest of the story. Loved reading this ! and yes .. I have experienced those "gift moments" and they are truly profound ..
Great post! 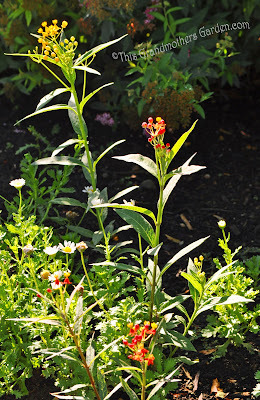 Isn't it wonderful that the milkweed appeared so mysteriously along with the butterfly weed. I too would like to have more butterflies in my garden. They don't usually appear until late summer here. I find sedum and echinacea also tends to be favourites. ooohhh, I love the anticipation... I savor those grace-filled moments. I remember a late-summer encounter with a hummingbird that was similar to this. What a beautiful post! 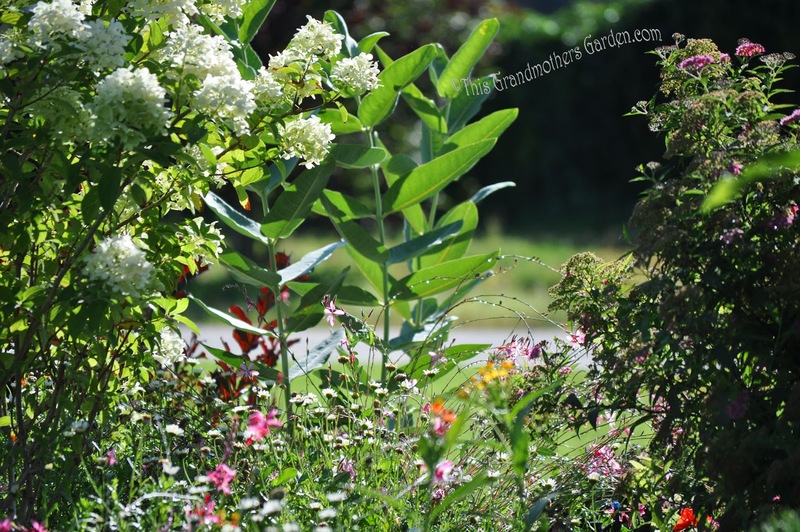 I'd love to have you participate in the "Garden Lessons Learned" meme at http://bit.ly/oV7By4. Happy autumn! I think that we are given what we need at that moment. You were blessed, and how beautifully. Can't wait to hear the rest of the story. Oh I love, love, love this post. Your monarch came to pose for you. Hi, Enjoyed your 3 posts and look forward to the hatching. We've had monarch and black swallowtail caterpillars - I don't know where the chrysalis are, though. I'm hoping they all make it!